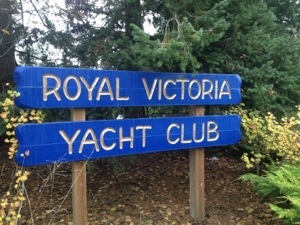 For those of you not on Facebook – and I know there are more than a few – I’m adding some of the images I took recently from my time at the Royal Victoria Yacht Club. 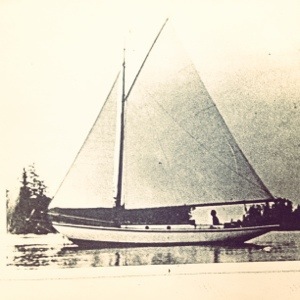 I was so delighted to discover that one of the club’s archivists had carefully searched every reference to “yachting” in the Victoria Times Colonist, and printed them out from microfiche records… Right back to the inception of the club in the 1890s! 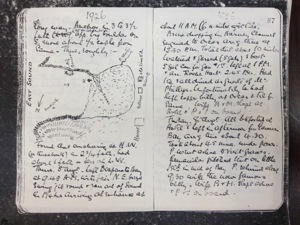 So it wasn’t too difficult to read through the 1896-1900 years and find references to WH Langley, Dorothy’s first owner, and his dealings with the Club. He was Club Commodore in 1904-06. 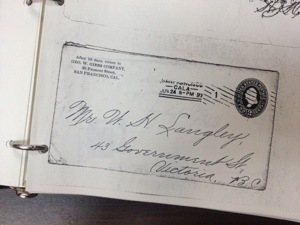 He also served as the lawyer for the plaintiff when the Club sued the builder of its first clubhouse after it sank! And I got to read of the tragedy that befell the Queen’s Jubilee celebrations in Victoria when a train carrying merrymakers to the waterfront so they could watch the yacht races and mock battles, crashed into the water, killing some 50 souls. The news accounts are so compelling I must admit I got sidetracked a bit from my Dorothy research. Fascinating stuff. 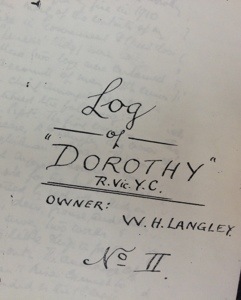 But what’s more, there was a whole binder full of Dorothy material that I hadn’t seen before: letters from Langley to Linton Hope in England, Dorothy’s designer, lists of Langley’s expenditures on his new boat, bills of sale on everything from the anchor to ropes and lead for her keel! This man was meticulous, and somehow these precious records have been preserved for over a century. The copies I saw were photocopies to be true, but it must mean that the originals aren’t far. 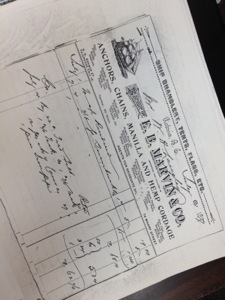 Thank you to Ken Reksten and Gord Nickells for letting me in and giving me so much time with these precious documents. More gold! Keep in mind the campaign to support the documentary about Dorothy’s life “Between Wood and Water” is online for only one more week! Donate now and get a choice of some amazing perks and gifts (in time for Christmas!) Share with your friends and family and be part of making this doc an important film in the canon of BC maritime history. 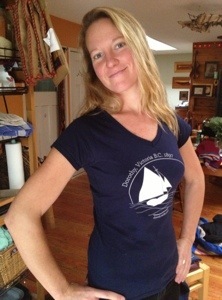 Campaign ends Nov 15. Thank you! Hi Dorothy! You can order the special Dorothy pendants through our fundraiser at https://www.indiegogo.com/projects/dorothy-documentary/ They are $100 and Lindsay is donating all proceeds to the film. This campaign is on for only 6 more days. Email me at dorothysails@gmail.com for more info.